Splash page from Hit Comics #12 (1941). Art by Reed Crandall. If anything, Hercules resembled Quality’s own hero, Doll Man. Both features were created by Eisner/Iger men and both drawn at some point (though not created) by Reed Crandall. Joe Hercules’ first adventure attempted to move him a step away from Quality’s own fictional universe; the story asserted that Doll Man was only a character who existed in the comic books of Joe Hercules’s world. Before long, Hercules’s powers grew far beyond those of mortal men but the sales didn’t grow to match. It wasn’t for lack of promotion. Quality featured Hercules on the covers of Hit Comics #3, 10-17 and put him in the first feature slot. Curiously, “Hercules” was replaced by a similar strongman, Stormy Foster, and the two overlapped for a few months. The first story was signed with the pen name “Dan Enloz” (spelled backwards yields the beginning of “Zolnerowich”). With the second issue, the byline changed to “Gregg Powers,” which was probably Zolnerowich, but Reed Crandall also used that alias when he drew it (Hit #11–16). Another Quality hero, the Unknown, also looked like Hercules and Doll Man. One month before Quality, two other publishers unveiled their own Hercules. Timely’s was a remarkable strongman (Mystic Comics #3). 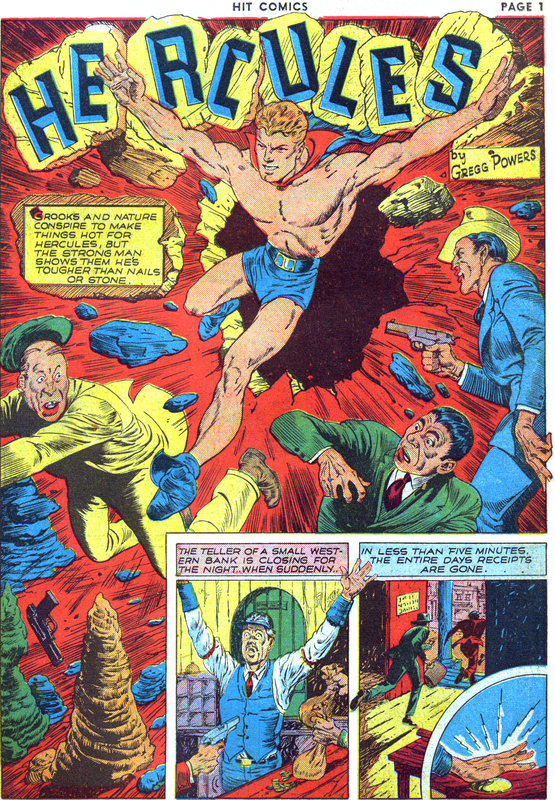 And MLJ’s Hercules was about the Greek hero coming to modern-day America (Blue Ribbon Comics #4). The popular films starring Steve Reeves weren’t released until the late 1950s. Hercules, when he first debuted, was supposedly non-super-powered. His brawn grew rapidly to allow impossible feats of strength, like stopping and lifting a cars, crushing guns, and leaping up mountains. He seemed to be invulnerable, even surviving a fall from a tall building.